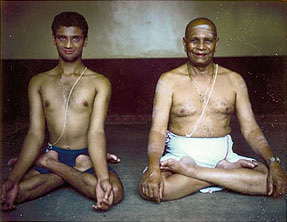 R. Sharath Jois and Sri K. Pattabhi Jois in Mysore, in 1997. This was one of the early test photos taken for the English edition of Yoga Mala by Sri K. Pattabhi Jois. The modern lineage of Ashtanga yoga dates back to the 1920s, when the the famed yogi T. Krishnamacharya began teaching yoga at the Royal Palace in Mysore, India. One of his students was a boy named Krishna Patthabhi Jois, who, so taken was he with the practice of yoga he had seen in a demonstration, left his village at the age of twelve to join Krishnamacharya in Mysore and study with him. Jois stayed with his guru for some two decades and learned the entire Ashtanga system. When Jois had completed his studies, Krishnamacharya entrusted him with teaching the practice according to the way he had been taught. Accordingly, Pattabhi Jois - "Guruji" as he eventually came to be known to his many thousands of students - taught the practice daily from his home in Mysore to all who cared to learn it for 65 years until his death at the age of 93 in 2009. He also took many teaching trips, or "tours," abroad. Through his tireless efforts, Ashtanga yoga is now known and practiced worldwide. In his later years, Guruji entrusted the teaching of the Ashtanga system to his grandson, Sri R. Sharath Jois. For many years, Sharath assisted Guruji in teaching; following Guruji’s passing in 2009, Sharath assumed directorship of the Sri K. Pattabhi Jois Ashtanga Yoga Institute (KPJAYI). Sharath continues to teach in the tradition of his grandfather. There are eight distinct areas of yoga practice, known as "limbs," that make up the Ashtanga system (listed at left). The starting point for practice is the third limb — asanas (postures). Instruction in the practice is mostly confined to the first three - or sometimes four - limbs: avoiding wrong behavior (yamas), acting virtuously (niyamas), practicing postures (asanas) and breath control (pranayama). The remaining four limbs are considered "not teachable" in that they are essentially deeper and deeper forms of meditation that the practitioner, if he or she is diligent and blessed and has thoroughly mastered the preceding limbs, may arrive at organically.